I was one of the 40+ million viewers that watched at least part of the 61st Grammy Awards on Sunday night. While I’d love to see just one heavy metal performance and have delusions of a Slayer and Lamb of God duet out of left freaking field, I really enjoy the wide range of music that’s on display each year. The highlight of the night for me was watching Alicia Keys use two pianos at once and then perform snippets of different songs. It was an outstanding presentation. Come again, LeBron? Like icing on the cake? That is such a losing mentality. It’s the definition of resting on your laurels. It doesn’t sound like LeBron is aching to win a championship because, well, he isn’t. I never want to hear an athlete become satisfied with previous achievements. Imagine this mentality being applied to the entertainment world. What if Alicia Keys said before her dual-piano performance, “Hey, I’ve got 15 Grammys already. Who cares if this goes well or not?” I can’t imagine her routine sounding as good if the approach was that complacent. I also enjoyed Lady Gaga’s performance. What if she said to herself before hitting the stage, “I was just in a blockbuster movie. I’ve won nine Grammys. If this goes well, that’s cool. If not, ehh, that’s fine.” The chances of achieving greatness dwindle drastically if you’re content with past achievements. This thought applies perfectly to sports radio as well. Listeners don’t care about the past. They care about the here and now. The audience won’t stick around if Colin Cowherd or Dan Le Batard are mailing it in regardless of their previous accomplishments. There are too many other choices. Think of a franchise like the Oakland Raiders that has had past success but presently struggles. In spite of three Super Bowl triumphs, their stadium has been half filled for years with tarps over seats because the team currently stinks. Listeners behave the same way. If your product is bad, they are adios amigos. Sports radio is built on conditional love. If the show is a good product, the listeners will stick around. The minute the product turns bad? Well, that’s the moment the audience’s love all of a sudden is not unconditional. This is why it’s so important to have people in your sports radio building that are hungry. If you’re a person living off of past accomplishments, I don’t want you on my team. I don’t want you as my producer or technical director. I don’t want you as my update anchor. I don’t want you as my boss. I don’t want anything to do with anybody who’s satisfied because their performance will show it. Matt Balis is the Director of Football Performance at Notre Dame. He has a board that accounts for every player that enters the weight room. Each player’s name appears on a magnetic strip that Balis can move into three categories: starving, hungry, or satisfied. Which category is best for a team to be in? It’s easily starving. Think about the difference in performance between a football player that is either starving or satisfied. The results can be staggering. It works the same way in sports radio also. Brady acts like he hasn’t won a single championship. LeBron acts like he’s won three. 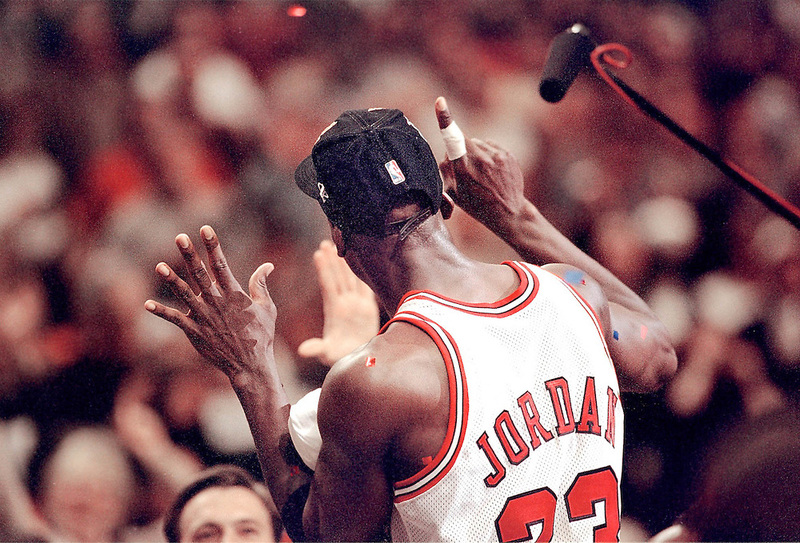 After the ’97 NBA Finals, I’ll never forget Jordan putting up five fingers to indicate his fifth championship. He then looked at the crowd and put up six fingers and then seven fingers. Jordan was conveying that he wanted to win more championships. He had just won a fifth title and minutes later he was thinking about the next one. Never being satisfied is a tremendous trait to have if you want to put yourself in a position to achieve more. I want to watch great athletes and musicians that are still starving to achieve more. I want to work with talented sports radio people that are still starving to reach new heights. Don’t let the weak thought of icing on the cake exist. The best way to enjoy more success is to pretend that the cake — meaning your past accomplishments — doesn’t exist either.